The stand-out story from last year's Dark Beyond The Stars anthology for me was Carindi, by Jennifer Foehner Wells. You can read my review of that anthology here - but the short version is great anthology, well worth your time. Wells' tale, exploring issues of identity, family and the use of language was splendid - and it's set in the same universe as her novel Fluency, so onto the reading list it went. I was surprised though by the very different character of the novel - where the short story was a thoughtful, gentle exploration, this is a rollicking adventure. The spacecraft in the Roswell incident was real in this world - a shuttle sent out from a giant spaceship lurking in the Asteroid Belt and time is running out for NASA to send a mission there. Up steps a team of experts - including a linguist who feels out-of-place but who holds the key to communicating with the alien presence lingering there. There's a whole grab bag of influences here - such as the likes of Carl Sagan's Contact, with lead character Jane Holloway's name even sounding a little like Ellie Arroway in that novel. But beyond that there are even hints of the mind-bending space journey seen in Solaris and pointed tips of the hat towards Tomb Raider and a wave of the tentacle towards Cthulhu. In mood, though, this almost feels like a spaceborne Indiana Jones adventure, with our female linguist taking the place of a certain whip-cracking archaeologist. It has that pulp-era feel, right down to the moments of comic embarrassment with a potential love interest. There are some well-placed rug pulls in the story, throwing the reader into the same state of confusion as Hollway as she tries to fathom what is going on after the team docks with the ship - and some authentic hard science in the mix too to keep it grounded. I'll confess I didn't particularly buy the romantic relationship in here - but then nor did I picture Indy with a shrill Kate Capshaw in Temple of Doom as a working relationship but it certainly doesn't slow matters down. Again, Wells explores the use of language in her work - although this time taking it a step further to explore communication without direct language use, too. 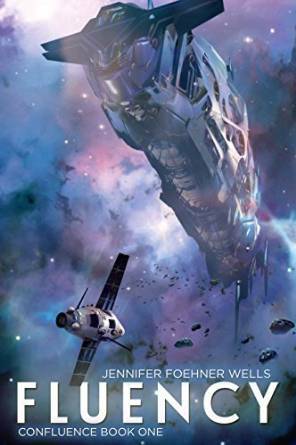 The moments of communication between radically different cultures were my favourite part of the book - and it's awfully well done, with Holloway becoming more confident in herself as she becomes more sure of her ability to communicate, and emerging as a leader as the rest of the mission begins to fall apart. Without spoilers, the closing of the book springboards directly towards the second book - Remanence - which has just been published. There's almost a sense of cliffhanger in that ending, but then... what pulp story doesn't end that way?